The headline pretty much summarises what this blog post is about. So let’s get straight into it! Question: Why should I use a travel agent? Answer: There are many reasons why one should use a travel agent to book their flights, holiday or business trip. Firstly, and perhaps the most important rationale, is that you have access to a REAL person. Not Bots. A Person! Thereby giving you the opportunity to ask any travel related question you may have, and receive an answer on the spot. For instance, you may be traveling to Singapore on holiday, however, you would like a 2-day stopover in Dubai. Would you need a visa for your stay in Dubai? What would be the quickest way to obtain a visa on the passport you will be traveling with? A travel agent can share helpful tips, and provide guidance to ensure you do not experience any trouble when you are many miles away from home. Furthermore, a travel agent can also help you save time and money. Travel Agents have the tools and resources to book multi-city and complex itineraries that can’t be booked online. At Gala Travels, you can enjoy a 24-hour service throughout the year. If you’ve missed your flight, or need to change your booking, you don’t need to wait at long lines at the airport or the airline’s phone. Our pick up time is less than 15 seconds, and our expert in-house team have over 150 years of joint experience! Question: How can I save money if I use a travel agent? Answer: A travel agent has access to wholesale rates with hotels, airlines, insurance companies, cruise lines etc. The agent or agency is always the first to receive special offers, therefore, you can always be sure to grab a great bargain before the package or flight you have been waiting for, is sold out! At Gala Travels, we can price-match (or event beat!) valid itineraries that can be verified. Question: Benefits of using a travel agent versus a comparison website? Answer: Did you know comparison sites pick and choose who is featured? Yes! Comparison sites are not unbiased. Simply put, fares on comparison sites are usually the cheapest lead-in fares to get you through the door, and they usually include multiple stops and reeaallly long layovers! You don’t like the sound of that, do you? Therefore save hours of unnecessary searching on multiple sites, and simply use a travel agent who will explain all the options to suit your personal requirements. At Gala Travels, our fares are very competitive and will most likely always be less than online sources. Question: Is it cheaper to book with the airline directly? Answer: The good news: Airlines provide consolidators like us with specially negotiated contract rates for international travel that are cheaper than rates provided by the airline directly. The not-so-bad news: Sometimes fares are the same as the airline – this is due to the airline’s own distribution rules. The good news: An agent can be more flexible with options, and can offer cheaper alternatives. In some cases, booking with a discounted agency like Gala Travels allows us to send a portion of a commission back to you! Nice, right? Question: When is the best time to book? Answer: Ah, the million dollar question! – The general rule is – as soon as possible! This is because the lower fares become fully booked the closer you get to the date of departure. Also, do bear in mind that travel is seasonal. School vacation periods are usually when fares are at their highest. To conclude: Flash sales end quickly and many cheap fares come with advance purchase requirements; therefore earlier is always better, regardless of what prediction tools may tell you. Question: Is travel insurance worth the expense? Answer: Absolutely, 100% Yes! – Consider your travel arrangements as an investment which you need to protect against things that you can’t foresee. For instance, a canceled flight, loss of baggage, medical emergencies etc. Furthermore, medical and cancellation costs can run into the thousands, and emergency repatriation can be 10’s of thousands! Thankfully, at Gala Travels our agents are qualified to offer you insurance products that suit your specific needs and budget. Oh and, don’t forget to ask about our “Change of Mind” insurance which allows a full refund on most flight tickets, even without a reason! Question: 1 travel hack or secret you can reveal? Answer: I will give you 3! Ask for cash-back on almost every all-inclusive package. Sometimes booking two one-way fares is cheaper than booking a roundtrip. By ordering a special meal on a flight (e.g. vegetarian etc. ), you are likely to be served before everyone else – thereby avoiding the rush for the washroom immediately after the meal service ends. Neat huh? – Oh and some useful tips: pre-pay for a comfy seat. It’s worth it! And lastly, please always be early. We recommend arriving 3 hours prior to your flight. You can never be sure of how long the airport line and security checks can take! 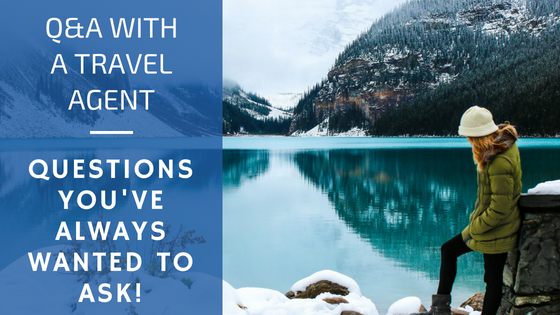 If you have any other travel related question, feel free to call us on: 1-866-458-4252.